This contest is now finished. The winners are listed below. chrisinwi, join us in March for the Spring Fling! looks like I was too late to enter, will do better next time. love this site, always finding new authors to read and the weekly chats! On Feb 27, 2016, ELF said: There goes the TBR mountain! 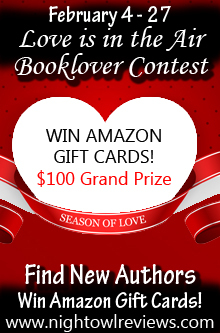 So many titles I am intrigued by...this is such a great way to find new authors to read! Eerie by C.M. McCoy sounds so interesting, along with Storm Warned by Dani Harper. On Feb 27, 2016, sienkielsa said: Great books! There are quite a few books that sounded really interesting including Storm Warned, Kiss of the Virgin Queen and Eerie!! They all look good - I can't choose. Thanks for the giveaway. On Feb 26, 2016, CrystalBee said: So many goodies! Eerie by CM Mccoy looks really good. Here are a few of the books I found that I'd really like to have: Dark Crossings, Immortal Flame, Spirit Bound, Untouchable Lover, Catching Dragos, Storm Warned, Willow's Discovery, Kiss of the Virgin Queen, Mercury Striking, and Eerie. All the books sound great and I even noticed some books that weren't on the list by some of the same authors that I'd be interested in reading as well. Though I have read a few of the books, I look forward to reading the rest as well. I'm going to start with A Pirate's Revenge by Meg Hennessy. Then, I have a few more I'm going to check out. On Feb 25, 2016, Bube said: Great titles! There's way too many to list. But I have already gotten 5 titles and will be getting more as soon as I read the ones I already got. On Feb 23, 2016, Tara W said: Fun Hunt! I found some great new books on the hunt and i'm really looking forward to reading Betrayed by Jaye Frances. On Feb 23, 2016, saleago said: Had fun. I'd like to read Accused and Mercury Striking to start off. On Feb 23, 2016, barbarawr said: Thanks for the great giveaway! There are so many to choose from that I want all the romantic ones, having just passed Valentine's Day and all. Holiday Hearts Awakening by Fiola Faelan, Shoot to Thrill by TL Schaefer, Under the Covers by Claire Boston, The Greek's Ready-Made Wife by Jennifer Faye. I think the book Eerie seems like I would enjoy reading. The books sounds Magical and I like that it's set in Alaska. I’m looking forward to reading Spirit Bound and The Greek’s Ready-Made Wife. On Feb 22, 2016, Adnor said: Tell us about the books you want to read that you found on this hunt. Honestly there were almost 100% of the books featured I would love to read!!! Could not just pick a few, greedy that I am. :D Thank you Tammie for, once again, a WONDERFUL 'hunt'!! Timeless Vision by Regan Black, The Greek's Ready Made wife by Jennifer Faye, and Spirit Bound by Tessa McFionn. A couple of the other authors intrigued me so I'll probably check them out too! I want to read....What the Marquess Sees by Amy Quinton, A Pirate's Revenge by Meg Hennessy, Happily Never After by Bess George, The Improper Bride by Lily Maxton. Mercury Striking and Storm Warned are at the top of my list. Smart Alex, shoot to kill, better than chocolate, blinded and kiss of the virgin queen. I think My Ladybird Story by Magus Tor sounds great. I have discovered a lot Eerie is one I had my eye on for awhile, Better than chocolate, Immortal Flame, Desiree Holt. I've discovered some new authors and series to read--Blindsided, Mercury Striking, and Her Web Master top the list. I can't wait to read books by Jennifer Faye and Jennifer Probst! Mercury Striking and Extreme Honor are my top two books I'm look forward to reading. CATCHING DRAGOS is the most intriguing to me. WOW, DO I HAVE TO CHOOSE ONE? LOL WELL.HOLIDAY HEARTS! What a great selection of books! Storm Warned by Dani Harper, Mercury Striking by Rebecca Zanetti, and Eerie by C.M McCoy are at the top of my list. On Feb 19, 2016, AshleyAnne said: so many great books! On Feb 19, 2016, Betty said: Wanna Read ALL of Them!!! On Feb 18, 2016, msdebms said: Need it. want it! Betrayed by Jaye Frances is the one I have put in my wishlist most recently. On Feb 18, 2016, gecko said: So Many to Choose From! Thank you for offering all your contests. I definitely found at least 4 titles that I am interested in purchasing! There are a lot of good books in this month's contest! The top of my list is Smart Alex. On Feb 17, 2016, michellebNPL said: so many! can't wait to read a lot of these! SMART ALEX and HER WEB MASTER look intriguing! I just want to read all of them. On Feb 16, 2016, Sebella Blue said: New to me PNR series. Spirit Bound by Tessa McFionn sounds like a must read! Jennifer Probs is the first one I'd love to read. Wow, there are so many great choices! I managed to narrow it down to these authors: Wendy Byrne, Jennifer Faye, Jennifer Probst, and Rebecca Zanetti. I can't believe how many books here that I want to read. But it's Meg Hennesy, Rebecca Zanetti and Desire Holt and Anna Quinlon . These are all such great reads. Some of the books I’m interested in reading are Mercury Striking, Tempted by a Kiss, and Her Web Master. All the books look interesting. I especially would like to read Fate's Prison by Tara Fox Hall as I love paranormal romance and it looks mystically alluring. On Feb 14, 2016, greenshamrock said: Books!!! so many books. I have a love/hate relationship with these contests because it gives me a list of books I have to buy. I can't wait to read Better than Chocolate by J. Lynn Rowan. It sounds great. Kiss of the Virgin Queen and The Greek's Ready-Made Wife. On Feb 12, 2016, Kittybooboo13 said: Had a Wonderful Time Exploring Authors & their Books! On Feb 12, 2016, AnghelalaOhh said: Books to read! Too many to choose from but what I really want to read is Happily Never After by Bess George ???? So many to choose from but I really like Rebecca Zanetti so Mercury Striking and Happily Never After by Bess George sounds really good too! Another great selection of books, my favorites to try first would be Spirit Bound by Tessa McFionn, Smart Alex by Sam Cheever, and Naked Hunger by Desiree Holt. I love doing savage hut learn about new books and authors. To me this a plus because I love to read. The easy thing would be to say that all of them sound pretty interesting, but I normally stick to historical fiction, so those would be my first choices. On Feb 11, 2016, Crazie Betty said: Awesome! This is such an awesome contest and giveaway! I have a whole new list of authors I want to check out now, thank you! On Feb 11, 2016, dawnmoneque said: SO MANY GREAT BOOKS! There's at least 10 of these books I already wanted to read and many more I'm sure I'd love! Gimme Gimme! Her Web Master, Timeless Vision,Betrayal, Improper Bride,1001 dark Nights,Catching Dragos, The Greeks Ready Made Wife, Kiss of the Virgin Queen,Under Covers, Storm Warned,Spirit Bound,What the Marquess sees, Pirates Revenge,Immortal Flame. On Feb 10, 2016, Laurel E said: So many to read, so little time! Wow, where to start? I won't list all the books I'd like to read, I'd be here to long. I would like to read Extreme Honor by Piper J. Drake, Betrayed by Jaye Frances, Storm Warned by Dani Harper .... that is just a few. I've found many books I want to read. On Feb 10, 2016, HaddieHarper said: San Juan! On Feb 10, 2016, Sylvie said: So Many Books! So many books and authors to choose from! I'm especially looking forward to Kiss of the Virgin Queen, My Web Master and My Ladybird Story. I want to read Mercury Striking by Rebecca Zanetti. I'd like to read My Web Master, because it's high time a web master was the subject of a romance novel. I am interested in reading a book by Meg Hennessy. On Feb 10, 2016, SandyH said: need to make some room! there are SO many books...so many new authors...and i have so little time...have to figure out how to deal with this! On Feb 10, 2016, MJSymmonds said: Books Galore!! Also many more to check out. Thanks. Can't wait to read Extreme Honor - True Heroes, #1 !! Blindsided by Jami Davenport is one in a series I was just introduced to, so that is a definite read. I also have had my eye on the 1001 Nights series as well. Jennifer Faye is an author I just recently read, her book A Moment on the Lips was pretty good so looking at her other works would be a good idea in my book. Blindsided by Jami Davenport & Spirit Bound by Tessa McFionn. Love doing these web hunts. Found at least 9 books and 7 new authors. Her Web Master, Mercury Striking, The Improper Bride just to name a few. Going to be looking for these new books. I would like to read Extreme Honor, The Improper Bride, 1001 Nights Searching for Mine, and Tempted By A Kiss. Thank you for the contest- I really enjoyed discovering the authors and their books. I have to go back to check - the one that caught my eye was the post-plague London scenario. I'll find it. I'd like to read Naked Hunger, The Improper Bride, and The Greek's Ready-Made Wife. Thanks for the giveaway. I want to read The Web Master, Betrayed, and Mercury Striking to name a few! Thank you for the giveaway and showing me these great books. I want to read most of these books! These giveaways are a lot of and gives me the chance to learn about new books. Jennifer Faye is one of my favorites but there are some authors new to me that I want to try as well. I found way to many books here that I want to read!! I think I would like Eerie and Fate's Prison. I saw some great books which I have added to my purchase list. Thank you for the chance at such a great giveaway!! I'd love to read the books by Jennifer Faye, Jennifer Probst and Desiree Holt. I added way too many to my tbr but I got really excited by Spirit Bound , Untoucable Lover ,The Improper Bride, and Extreme Honor. Thank you for the fun contest and new books to check out. On Feb 07, 2016, KGOLDMAN said: Books, Books and more Books! wow added the pirates revenge and a few others to my amazon wish list. I always love these scavenger hunts. I look forward to reading Amy Quinton, Meg Hennessy, and Jennifer Probst. I found many great books including Betrayal by Jaye Francis, Naked Hunger by Desiree Holt, Storm Warned by Dani Harper and Better Than Chocolate by J.Lynn Rowan. Just to name two; the books by Regan Black and Jennifer Probst top my list. So many great books I want to read from this list. On Feb 06, 2016, Shadow said: Great books! There are so many good books! Ive read some of them already, just finished Catching Dragos. Love this series! :D I cant wait to read Kiss of the Virgin Queen. Already have it on my list and gonna read soon! :) Thank you all for the awesome giveaway and for sharing all your great books! Tempted by a kiss, sounds interesting. I am looking forward to reading My Ladybird Story and Better Than Chocolate. I would like to read any of the historical and contemporary romances. There are so many that appear to be good. Thank you for the chance to win. I liked the sound of Blindsided by Jami Davenport; The Greeks Ready Made Wife by Jennifer Faye; Searching For Mine by Jennifer Probst; Tempted By A Kiss by Anna Durand and Her Web Master by Normandie Alleman. There are so many wonderful books in this list that it is impossible to choose just a few. I'd love to read them all! I especially like the historical and the paranormal and when they are combined, WOW. Thanks for this awesome opportunity. I really like the sound of Accused by Wendy Bryne. I couldn't find the phrase for the missing word in the blurb for Accused. what am I missing? Did I just over look it? On Feb 05, 2016, Diana Ware Page said: Books I'd like to read. I've read C.M. McCoy's Eerie and loved it !! Would like to read Gail Koger's Dragon book next. On Feb 05, 2016, mwhite said: "Improper Bride"
I would like to read "Improper Bride". Thanks for the chance to win. Thanks for another chance to win. All the books sound interesting. I found lots of new books for my Neverending TBR list. On Feb 05, 2016, carolynlmc said: Nice Giveaway! I really liked a few books that I would not not normally buy. I really liked Improper Bride, and Dark Crossings I put a few on my Wish list! Thanks for the Giveaway! Looking to read Kiss of the Virgin. I would like to read a book by Tara Fox Hall. I would enjoy reading all these stories. On Feb 05, 2016, Dee Huff said: Wow! Oh the things we book lovers go through for our books!! I hope this is where I'm to leave the comment for the Rafflecopter, because I've worked HARD to get logged in at all!!! :) Thanks for the great giveaway! See you in the pages! Accused, Immortal Flame, Dark Crossings are a few books I would read. But I would read all the paranormal books I can get my hands on lol. On Feb 04, 2016, TamTam said: WOWZERS! So many "new to me" authors. I especially want to start reading Regan Black, Rosalie Redd, meg Hennessey, Jaye Frances, Lily Maxton, Jennifer Probst, Jillian David and Amy Quinton. I HIGHLY recommend Eerie by C.M. McCoy. It is Creepalicious! There are so many that sound wonderful. Kiss of the Virgin Queen, Under the Covers, Mercury Striking, Untouchable Lover, and many, many more. On Feb 04, 2016, melissaq said: Books I want to read. On Feb 04, 2016, cmmccoy said: Awesome scavenger hunt! Love seeing all these new books and authors! thx! As long as the book isn't a paranormal, fantasy type romance I'll want to read it. I do own THE GREEK'S READY-MADE WIFE already and it just recently arrived. There are a few I would like to read. Tempted by a Kiss by Anna Durand is one of them and I love Jennifer Faye. So glad I found this site! Thank you C.M. McCoy!!! Such a fantastic way to introduce and showcase new books! Thank you! I would like to read the books mentioned by these authors: Meg Hennessy, Rosalie Redd and Jennifer Faye. Eerie, Happily Never After, Blindsided, and Under The Covers are just a few. I would love to read any of These books?? On Feb 04, 2016, senese said: So many goio Choices!!! I want to read them all,some are already,on my Good read list! Better than Chocolate looks really good..
Immortal Flame (Hell to Pay) is a definite read for me. The entire series looks great. I love NOR contests, it is great to be able to find great reads. They all sound good. I can't choose.